Former Wales back Gavin Henson has spoken about the isolation he felt during his injury absence after kicking Bristol to victory over rivals Bath. The 35-year-old had played less than an hour of rugby all season before coming back from a shoulder problem on Sunday. "To be out that long I feel pretty guilty about it - I haven't done much for the club, so I felt I owed a big performance," he told BBC Bristol. "The main thing I was thinking was 'just don't get injured.'" 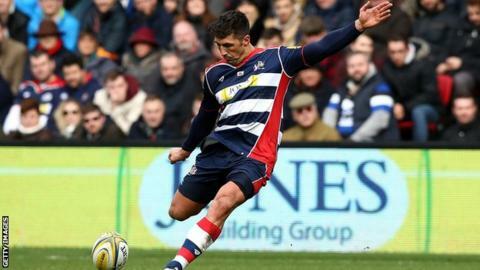 Henson slotted a drop-goal and kicked three penalties as Bristol, bottom of the Premiership, beat Bath for the first time in 11 years to move to within two points of 11th-placed Worcester. He lasted just 12 minutes on his previous injury comeback in November and has spent almost four months on the sidelines since. "It's been tough being out for so long and I become a loner when I'm injured," he added. "I was so tired. I was tired from the first minute and I was just thinking maybe the second wind will come in, and it didn't. "I've got a lot of friends at Bath because I played there not so long ago so I was a little bit nervous. Obviously because I've been out for four months and the last thing I want to do is get injured again. "I had a little bit of everything I think. I'm 35 and still making those breaks, it's pretty good, so hopefully I've got a few years left."